Walters Way is in the London Festival of Architecture on June 4 2017, 1-5pm. It is a chance to see the houses and meet Segal enthusiasts. There will also be a display from RUSS the new Segal-inspired self-build housing project. Walters Way is in Honor Oak Park, SE23 3LH. From Sat 16th Jan - Thurs 24th March 2016. The exhibition focuses on Segal's work with the self-builders, especially the creation of Walters Way and Segal Close in Lewisham. It will have will have a section of a Segal house showing key features of a Segal structures well as Segal furniture, archive films, photos and drawings. 19th September 2015 Celebrating Segal - learn about Walter Segal, his life and legacy. Lewisham, London. 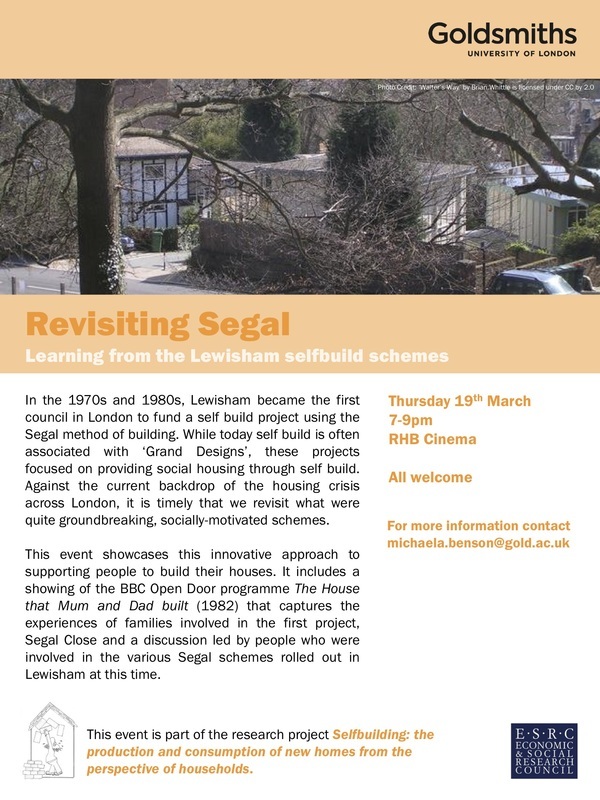 16th April 2015 - An evening with.....Walter Segal self-build in Lewisham, London. Organised by Open City. A chance to visit a Walter Segal housing development, see inside two of the houses and meet some of the builders.